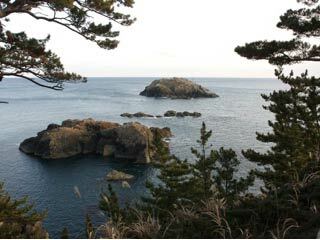 Cape Tatsumai (龍舞崎) is one of the tourist spot in Oshima, Kesennuma. It has a great view with unique rocks. Those unique rocks are made by sea waves. Tatsumai literary means "The dance of dragon." It was named because when wave splashes, it looks like that a dragon is dancing. There are many spots which named after the famous fairy tale "Urashima Taro." Be very careful at the cliff. The rocks and the barriers are very fragile because of the earthquake.